How will Zack Snyder "explode" Batman and Superman's universes? Check out our first look at the Suicide Squad on Arrow! Norman Reedus hints at the eventual reunion of the Walking Dead characters. And Agents of SHIELD's going to incorporate every Marvel character that it can. Plus The Flash and Under the Dome season 2 begin filming. Spoilers now! There are two ways to think about it. We know the material. Unfortunately, the fans don't know the material. So, we're casting according to what's happening in the script. And we're hoping that leads to enough originality, enough perspective on what we're doing that you get something fresh and exciting. I understand the canon. I'm not crazy. I know what these characters need from a mythological standpoint. I think Jesse is going to be an amazing Lex. [The movie] literally takes the "Man of Steel" and "Batman" universes and explodes them. You're not as tied to the mythology. In "Man of Steel," we had to create an origin story, a mythology, and there's a lot of energy into that, which we love doing. Don't get me wrong. But when you think about how fun it is too — now that you've got these characters — to now let 'em loose. That's fun! Everyone pairs Beth up with Carl in this weird way and she's much older than Carl. He's looking for comics and she's looking for food. They're definitely not the same age. I can't tell you if there's going to be a romantic thing; we're not allowed to talk about that stuff. But never say never! She's a cute girl in the zombie apocalypse and Daryl could do much worse. That spoon [marked Washington D.C.] might be some sort of foreshadowing; you never know! Could they cross paths [with Abraham, Eugene, and Rosita]? Never say never. It's interesting to watch everybody lost. If you watch this episode and last week's closely, Daryl and Beth walk by that log and there's the bunnies and that's where Lizzie was killing a bunny. As we walk, there are little clues that they're not as far from everyone as they think they are. Carl leaves a candy wrapper; there are little things on the ground that show you that they're zigzagging without knowing they're zigzagging. Here's a teaser for the next featurette, which is a look back at season three but also seems like it'll include some teases for where the characters are ending up. Whedon: We can say that his character's a lot of fun. In just initially talking about the character, his name came up of dream choices to play someone with this sort of attitude about S.H.I.E.L.D., as a contrast to Coulson. Coulson's always been the company man with a dry sense of humor, whereas Garrett's a guy who never wanted to wear the tie, never wanted to be behind a desk. He's in the field because he likes being in the field. He likes blowing things up. Tancharoen: He likes getting his hands dirty. Whedon: Their friendship and back-and-forth has been a real pleasure to write, and seeing Paxton do it every day — we're having a blast. Tancharoen: If they're excited about Deathlok, then they should be excited about the things to come. Whedon: We're in a weird spot, because if the character is big and cool enough, then they're probably planning a movie. [Laughs] We have a fairly large list of characters that we have at our disposal, and we plan on exploring all of them. AMANDA WALLER SENDS THE SUICIDE SQUAD OUT ON THEIR FIRST MISSION — Following Slade's (Manu Bennett) return and his promise to make good on his threat to destroy Oliver's (Stephen Amell) loved ones, Oliver focuses all his energy on preparing for battle with his former friend. Sarah (Caity Lotz) tries to help but, fearing for her safety, Oliver pushes her away. Meanwhile, Diggle (David Ramsey) is recruited by Amanda Waller (guest star Cynthia Addai-Robinson) and A.R.G.U.S. to stop a warlord (guest star Lee Majdoub) he knew from his time in Afghanistan. Always the solider, Diggle agrees to help. 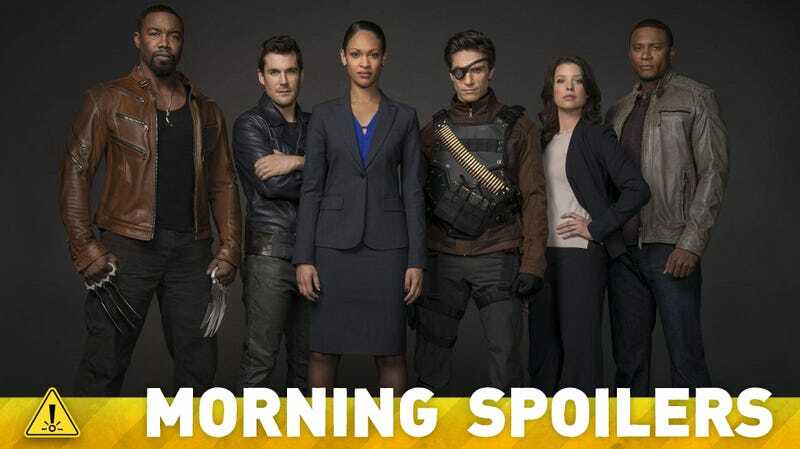 However, he's not prepared when Amanda introduces him to the rest of the team – Deadshot (guest star Michael Rowe), Bronze Tiger (guest star Michael Jai White) and Shrapnel (guest star Sean Maher), all criminals he and Arrow helped put away. Lyla (guest star Audrey Marie Anderson) defends the team and explains the world is a complicated place, but Diggle isn't sure he agrees. When the mission takes a dangerous turn, Diggle is forced to make a difficult decision. Larry Teng directed the episode written by Keto Shimizu & Bryan Q. Miller (#216). Go here for more photos from "Suicide Squad." "Two Rivers" – Exhuming Jacob's grave only deepens the mystery of his return. Henry struggles to accept that Jacob is really the son he lost 30 years ago. Bellamy and Maggie search for a connection between Jacob and Caleb's deaths and wonder if the local river may hold a clue. Their digging also unearths Caleb's criminal past – he robbed the bank his daughter Elaine works at just days before his death. Pastor Tom's life is changed forever by a shocking turn of events, on "Resurrection," SUNDAY, MARCH 23 (9:00-10:00 p.m., ET) on the ABC Television Network. Guest starring are Veronica Cartwright as Helen Edgerton, Kathleen Munroe as Rachael Braidwood, Ned Bellamy as Samuel Catlin,, Travis Young as Ray Richards, Jason Saucier as Dale Getheard, Kevin Sizemore as Gary Humphrey, Joe Knezevich as young Henry, Ellen Wall as the bartender and Matthew Wingfield Sligh as Eddie. "Two Rivers" was written by Nicki Paluga and directed by Kevin Dowling. "Heart of the Matter" - Alice and Cyrus discover alarming information involving prisoners Jafar has under his control and changes their priorities. Meanwhile, the Red Queen is in critical danger and no one can help her except the Knave by surrendering information to Jafar that he's been desperately seeking. In flashback, Anastasia is about to marry the King and strikes up a friendship with Cora that directly impacts Will. Cora also confronts Will resulting with him asking her for a shocking demand, on "Once Upon a Time in Wonderland," THURSDAY, MARCH 20 (8:00-9:00 p.m., ET) on the ABC Television Network. "Heart of the Matter" guest stars include Iggy Pop as the voice of the Caterpillar, Trevor Lerner as Burly Guy, Matty Finochio as Tweedle #1, Ben Cotton as Tweedle #2, Peta Sergeant as Jabberwocky, Brian George as Old Prisoner, Barbara Hershey as Cora and Michael Jonsson as King's Guard. "Heart of the Matter" was written by Jenny Kao and Katie Wech and directed by David Boyd.